Fontazzi Buttercrunch Popcorn 5 oz. Fontazzi Honey Mustard Pretzels 6 oz. Cranberry Harvest Medley 2 oz. Classic Fruit and Nut Mix 1.5 oz. 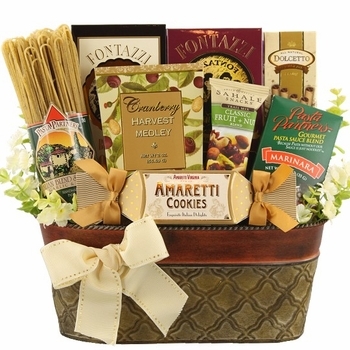 Italian Amaretti Cookies in Bow Box .9 oz. 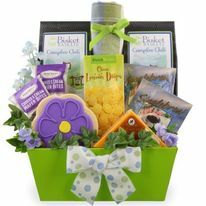 Gift Size 12" x 6" x 12"
This outstanding family meal gift is an impeccable choice to send to friends, family and corporate clients. 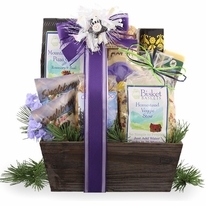 Designed inside a beautiful and reusable metal container the gift recipient will enjoy a host assortment of gourmet Italian goodies. 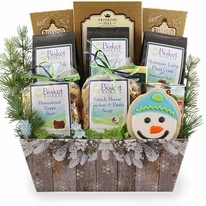 A gourmet spaghetti dinner for the family (6 servings) along with decadent cookies and pastry treats for all to enjoy.